Much of our everyday existence is filled with routine. While some things are only done occasionally, there are a whole host of things that we do on a daily basis that are so routine that we may not even realize that we do them. And that’s not always a bad thing, for there are spiritual and temporal habits that are healthy and should be second nature to us. What I want to talk about are the things we ought to do on a daily basis so that they become part of who we are, but that get relegated to one day a week or times of deep distress and spiritual need. The apostle Paul, in his letter to the Colossians talked about some of those things. 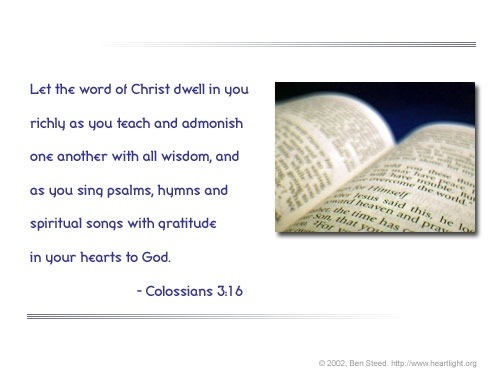 The foundation for all of this, is letting the word of Christ dwell in you. But not just a sparingly, but richly. We need to have an overflowing abundance of the Word of God inside of us, so that it is always coloring whatever we do on a daily basis. Now I don’t care how good your preacher or teachers are, they cannot get this level of the Word into you, any more than you could sit down one day and eat enough physical food to nourish your body for the rest of the week! We have to hunger and thirst after spiritual food, and that happens when we go to the Word and take it in on a daily basis. In the physical realm, there comes a point when someone is starving that they lose their appetite. In time, they become so weak that they lack the energy and will to eat. The same thing can happen spiritually if we do not feast in the Word of God. What is amazing about the Word of God is that the more you read it, the hungrier you get for it. We need to feast on the Word in order to grow and thrive. What will the result of an overflowing abundance of the Word of God be in our lives? We will begin to have the Word come to mind just when we need it, or when someone else needs it. We can be a resource to help others along the way. We also begin to see things from a scriptural perspective, which is good, because in the end, it only really matters what God thinks about things, not what our own opinions are. If we continually feast on the Word, there can press on towards the time when whatever we say and do will be affected by what we have taken in from our consumption of the truths of God’s Word. Does that mean that we cannot do anything at all without chapter and verse to authorize it? Of course not. Try finding a verse that says to floss your teeth! But the point is that when we start to see the pattern, albeit through a glass darkly, of how God thinks and the principles that we should live by, we can slowly move to conform our daily lives into ones that honor God and our Savior Jesus Christ. We can start doing things “in His name”, for we are His ambassadors here on the earth. The natural and continual by product of this type of living is a spirit of thanksgiving. Our gratitude will be another thing that permeates out thinking and our actions. In turn, that gratitude will spur us on to greater love and good works. Which will make us grateful, etc. it’s a continual upward spiral! But again, the foundation is a continual taking in of the Word. If we stop and depend on what we read in the past alone, we will grow weak, lose our spiritual appetite, and starve. We will also be ungrateful. So the next time you pick up the table, try doing this: open it up, pray, and then as you begin to read say, “lets eat!” and spiritually chow down. After all, you have to be full before you can overflow. Your answer lifts the inltcligenee of the debate.